Trio Matamoros con dos guftarras: El manicero (The peanut vendor). Trio Matamoros: Elixir de la Vida. Trio Matamoros: Mujer Celosa (Jealous Woman). Sexteto Habanero: Amparo. Septelo Matamoros: Falsa Eva, Tu veras (You'll see). Rico's Creole Band: Lunento esclavo (Stave's lament). Canario y su grupa: Alia va (There ti goes). Orquesta Victor Antiltana: Menealo que se empelota (Stir it up or she'll get annoyed). Pftita y su grupo: Sufrimierto (Suffering). Rico's Creole Band: Mohl aime, doudou motn (My love. my sweet). Orqueata Hermanoa Castro Canto por Eddy Urquia: Alegre Conga (Happy conga). Vicente Sigter y su orq: Boton de Rosa (Rose bud). Don Azpiazu and his orchestra: La Guajira (Country woman). Antonio Machin et son orchestre cubain: Cacliumbamba. Xavier Cugat and his Waldorf-Astoria Orchestra: Elube Chango. Arsenic Rodriguer y su Conjunto: Dundumbanza. Trio Yara y Abelardtto Vatdes y su grupo: Babae. Trio Yara Aires: Cubanos. Rico's Creole Band: Madalana. Lulz Gonzaga: Juizeiro. 65 minutes. So, we are used to 'Out of Africa' and all the resonances that this concept has. But, for some time, we have been aware of not just how African music went westwards to the American continents, but how music from the Caribbean travelled back to western Africa. We know that Congolese versions of, for instance, rumba, permeated outwards, to eastern and southern Africa. 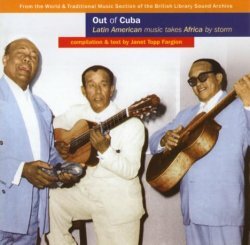 This album, put together by Janet Topp Fargion and forming one of the series from the World and Traditional Music Section of the British Library Sound Archive, creates a snapshot of what Africans could hear on recordings in the decades either side of World War II, from the 1930s to the 1950s. It reissues a number of the HMV GV series, a catalogue of roughly 250 double-sided 78rpm discs issued between 1933 and about 1958. The GV series was initially aimed at the West African market. It comprised almost entirely Latin music, taken from the Gramophone and Victor catalogues, mainly Cuban but also including Puerto Rican and Brazilian musics and, latterly, a few other Caribbean and even West African releases. From West Africa, it spread, having great influence in the Congos, but reaching across the whole continent, to the extent that many African musicians at the time and since have begun their careers singing covers of GV repertory, subsequently developing their own musical expressions from the musical grounding that these recordings have given them. In many ways, this is a research document more than an album of music. As recording companies sought to expand their markets, re-releasing the Gramophone and Victor recordings made commercial sense, to some extent replacing the earlier habit of sending engineers to remote areas to make new recordings for local markets. The latter, as we might expect, was often fraught with difficulties, but it was also expensive, and was therefore hardly possible as companies tightened their belts following the stock market crash and as the world inched towards war. As research, the 20-page booklet discusses at length the impact that the recordings had in Africa: 'Latin music caught on strongest in the French and Belgian colonies (Guinea, Mali, Senegal and the Congos)'. The impact in the Congos was perhaps most significant, and by 1955, supplemented by the Congolese label Ngoma, the Congolese bought some 500,000 records annually and frequented the 300 bars in the African quarter of Kinshasa. Many of the local products issued on the Ngoma label were reworkings of the GV series; many local musicians used Spanish words that they would not have been understood, but these were gradually replaced by lyrics in the local Lingala language. Cuban son had great impact, leading to two-part songs with lyrics centred on daily life and gossip, but we also have a contemporary account that relates how the rumba 'seems to be the dance which most reveals the African soul'. Rumba was in fact more likely to have been inspired by son, and as local styles developed, it remained common to label local songs as continuations of rumba. The above sketch gives a hint of what the album is about, but it is also put together by a curator at the largest European archive of recorded music, and Topp Fargion includes an additional background account, 'US and UK recording industries working hand in hand and the rise of Latin music on the international stage.' This does just what it says, considering the reasons why the series began, tied in to the Wall Street Crash, and contextualised as part of a mammoth recording industry that created a mechanism whereby music could cross borders and travel the world. It was, if you like, the beginnings of 'world music'. The archive connection means, of course, that the recordings, although taken from 78rpm discs, are of highly reasonable quality, occasional hiss (for example on track 12) and more background noise than we might expect from contemporary recordings notwithstanding. So, what are the musical forms represented here? Son (tracks 1, 3, 4, 5, 6, 7, 8, 10, 17), bolero (tracks 2, 8, 10, 13), rumba (tracks 7, 11, 14, 15, 16), Puerto Rican plena (track 9), conga ('a Latin American carnival road march that gained prominence in the US from around 1937', associated with the band leader Desi Arnaz; tracks 12, 18), guajira (Cuban country music; track 19), the Afro-Brazilian couple dance samba (track 20), and the northeastern Brazilian dance song baláo (track 21). All the recordings are from the GV series, with original recording dates from 1928 to 1953; original dates are given as well as the date and number of the GV re-release. With the exception of the first track, the information given for each is restricted to a sentence or two, supplemented by photographs that reproduce a few of the specific labels and photographs of singers or groups. The first track is the most familiar, Trio Matamoros con dos guitarras playing Moises Simons' composition, 'El manicero/The peanut vendor', recorded in 1929 by Victor and released on HMV GV 3 (A53953). This was the song that 'set Cuban music going in the US and worldwide', and so this is actually not the first version that was released in the GV series: the very first GV release was of this song by Don Azpiazu with vocals by Antonio Machin. There are, of course, many more recent samplers of Cuban music, and this album does not try to duplicate them. Those who buy this Topic release are likely to be interested in history. The historical context is coupled to a legacy. The context begins when what Topp Fargion refers to as the 'joy years of the recording industry' came to an end with the collapse of the stock market, and continued until the end of colonialism was in sight. The latter, the legacy, provides an explanation for an African musical creativity that continues to this day, based on the GV Latin sounds. The album, then, brings a sonic dimension to the historical story.